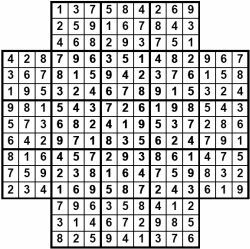 Star sudoku is a variety of the usual samurai sudoku puzzle. It is a much more tightly overlapping set of puzzles. In fact, the central puzzle is created completely by the other four grids that are to its left, right, top and bottom. However you need to remember it is still a valid puzzle that obeys the sudoku rules in order to solve the puzzle. Samurai star sudokus - also known as 'flower sudoku' due to its shape, tend to be particularly tricky to solve particularly the first few times you attempt them, due to the complexity of having to check many different regions and overlapping areas to deduce the potential values for each cell in that region. It is a great challenge for experienced sudoku solvers looking for the next level of challenge! We can also provide these samurai star puzzles in a range of formats, standardly PDF black on white; you may also wish to have regions coloured for added clarity if you print in colour plates or in one additional colour - you may specify your requirements. Publishers - Please contact us to buy Samurai Star Sudoku puzzles for publication in your book, magazine, newspaper, any other printed media or online.